Strawberry U-pick supporting Hillsborough County 4-H & helping area food banks. Saturday, March 17, 2018 from 8am-4pm. $.50 per quart & containers provided. 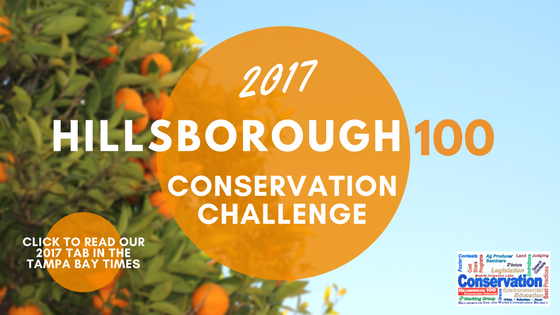 The 2018 Hillsborough 100 Conservation Challenge will be held April 21st - May 6th, 2018. These dates encompass Earth Day and National Stewardship Week. Hillsborough Soil & Water Conservation District is pleased to announce Supervisor Mark Proctor was recently elected Vice President of Area 3 at the annual Association of Florida Conservation Districts Meeting. The meeting was hosted by the Hillsborough Soil & Water Conservation District on April 8th at the Florida Strawberry Growers Association in Dover. Speakers, including representatives from partnering agencies, and the Annual Meeting were included in the program. Proctor’s platform included publicizing activities to increase visibility and awareness, exchanging ideas to mutually benefit all Area 3 districts, initiating fundraising to increase funding opportunities, enhancing involvement to strengthen participation of Area 3 Districts with AFCD and NACD, and reinforcing working relationships with all local, state and federal governmental and non-governmental entities. Proctor is Chairman of the Hillsborough Soil & Water Conservation District and has served as chairman of Tampa Sports Authority, president of the Greater Brandon Chamber of Commerce, Greater Tampa Association of Realtors, Kiwanis Club of Greater Brandon, and the President’s Roundtable of Brandon. The 58-year State contest was proudly hosted by the Hillsborough Soil and Water Conservation District this year. 34 student teams from all over Florida traveled to Hillsborough County to attend the 2017 State Land Judging competition. 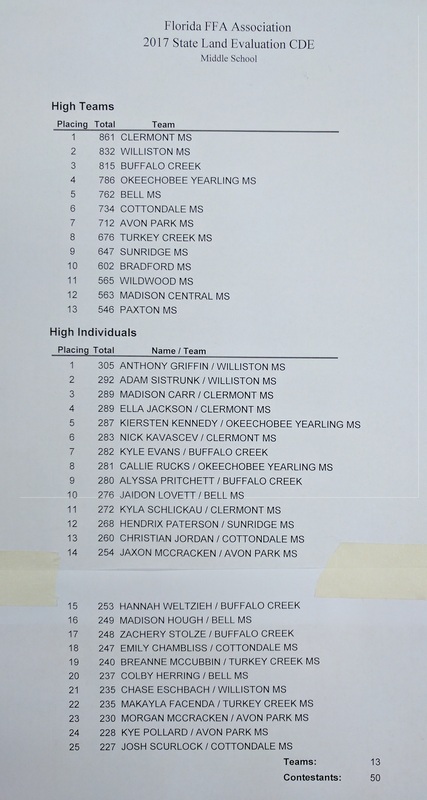 Both middle and high school 4-H and FFA students compete in this challenge to assess the soil properties in an unknown location, then best decide the proper land use practices for that area. Without the aid of electronic devices, students compete as teams and individuals using a rectangular outline in a perfectly manicured, head-high depression dug specifically for the challenge. The students examine this visual sample, but must not disturb it. The District was thrilled to receive donations from countless sponsors who all contributed to a goody bag stuffed to the brim with items from local Agricultural businesses and organizations. The hard work of Dr. Rex Ellis (UF-IFAS) and Gregory Means (UF-IFAS), along with Mr. Dennis Carlton of Audubon Ranch, and Castillo Farms, all played a major role in making the competition a huge success.